If someone shares a link to a file or folder located on Yandex.Disk with you, you can copy this file or folder to your Disk. To copy a file or a folder, click the link you received and then click the Save to Yandex.Disk button. The file or folder will be moved to the Downloads folder on your Disk. You can access the Downloads folder from the left panel. 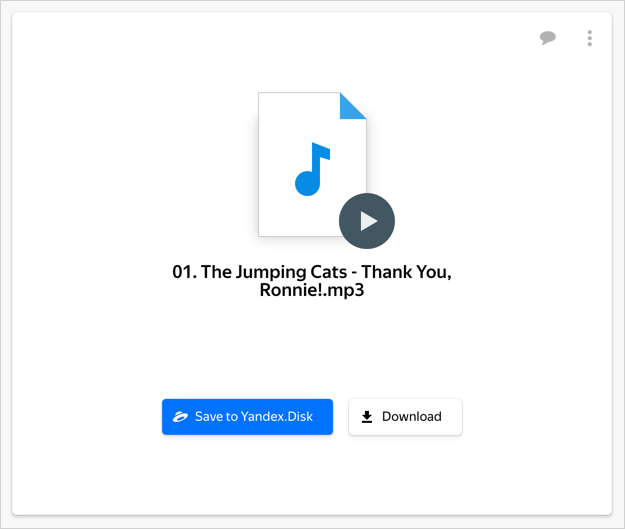 If someone shares a link to a file or folder located on Yandex.Disk with you, you can download this file or folder to your computer or mobile device. To save the shared file on your device, click the link you received and then click Download. Attention. Users can download a shared folder to their PCs as an archive file as long as the folder does not exceed 50 GB. If someone shares a link to a file or folder with you, you can leave comments, reply to them and add Likes and Dislikes to the published file or comments. To view or leave comments, click → Comments in the upper right corner. Each authorized user can rename and move shared folders on their personal Yandex.Disk. This does not have any effect on granting or getting access rights. Authorized users can revoke their own access to a shared folder by deleting the copy from their own Disk. If the owner of a shared folder deletes it, all authorized users will lose their access rights to the folder. A user with full access can view, download, modify, publish and delete files from a shared folder. A user with Read-only access can view and download files from a shared folder. Note. If you can't modify or delete a file from a shared folder, ask the owner for the full access to the folder. If the document owner grants you access to the folder with the document, you can edit the document together. The changes mage while editing are saved automatically. In the upper right corner of the screen, you can see who is currently working on the document. If you received a link to a document that you want to edit but you can't, ask the owner to give you full access to the document.